In the previous tutorial we learned how to use the TableAdapter Wizard to generate new stored procedures. In this tutorial we learn how the same TableAdapter Wizard can work with existing stored procedures. We also learn how to manually add new stored procedures to our database. In the preceding tutorial we saw how the Typed DataSet s TableAdapters could be configured to use stored procedures to access data rather than ad-hoc SQL statements. 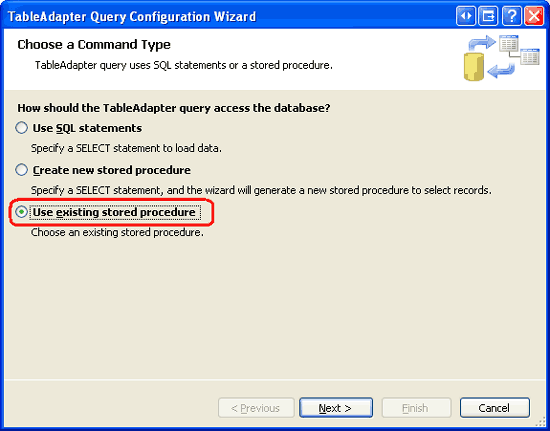 In particular, we examined how to have the TableAdapter wizard automatically create these stored procedures. When porting a legacy application to ASP.NET 2.0 or when building an ASP.NET 2.0 website around an existing data model, chances are that the database already contains the stored procedures we need. Alternatively, you may prefer to create your stored procedures by hand or through some tool other than the TableAdapter wizard that auto-generates your stored procedures. In this tutorial we will look at how to configure the TableAdapter to use existing stored procedures. Since the Northwind database only has a small set of built-in stored procedures, we will also look at the steps needed to manually add new stored procedures to the database through the Visual Studio environment. Let s get started! In the Wrapping Database Modifications within a Transaction tutorial we added methods to the TableAdapter to support transactions (BeginTransaction, CommitTransaction, and so on). Alternatively, transactions can be managed entirely within a stored procedure, which requires no modifications to the Data Access Layer code. In this tutorial we'll explore the T-SQL commands used to execute a stored procedure s statements within the scope of a transaction. Visual Studio makes it easy to add new stored procedures to a database. Let s add a new stored procedure to the Northwind database that returns all columns from the Products table for those that have a particular CategoryID value. From the Server Explorer window, expand the Northwind database so that its folders - Database Diagrams, Tables, Views, and so forth - are displayed. As we saw in the preceding tutorial, the Stored Procedures folder contains the database s existing stored procedures. To add a new stored procedure, simply right-click the Stored Procedures folder and choose the Add New Stored Procedure option from the context menu. As Figure 1 shows, selecting the Add New Stored Procedure option opens a script window in Visual Studio with the outline of the SQL script needed to create the stored procedure. It is our job to flesh out this script and execute it, at which point the stored procedure will be added to the database. This script, when executed, will add a new stored procedure to the Northwind database named Products_SelectByCategoryID. This stored procedure accepts a single input parameter (@CategoryID, of type int) and it returns all of the fields for those products with a matching CategoryID value. To execute this CREATE PROCEDURE script and add the stored procedure to the database, click the Save icon in the toolbar or hit Ctrl+S. After doing so, the Stored Procedures folder refreshes, showing the newly created stored procedure. Also, the script in the window will change subtlety from CREATE PROCEDURE dbo.Products_SelectProductByCategoryID to ALTER PROCEDURE dbo.Products_SelectProductByCategoryID. 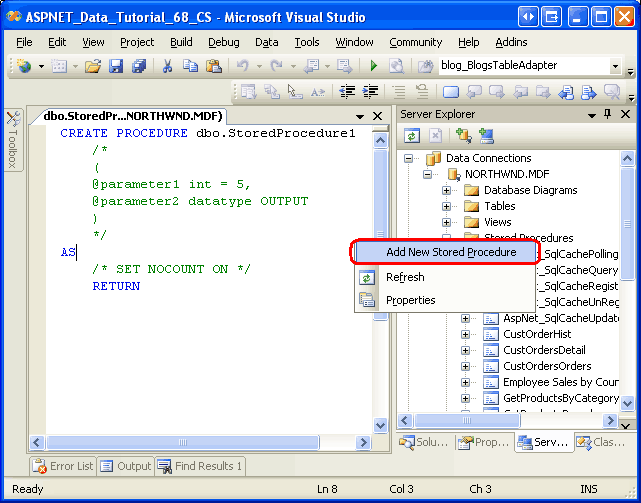 CREATE PROCEDURE adds a new stored procedure to the database, while ALTER PROCEDURE updates an existing one. Since the start of the script has changed to ALTER PROCEDURE, changing the stored procedures input parameters or SQL statements and clicking the Save icon will update the stored procedure with these changes. 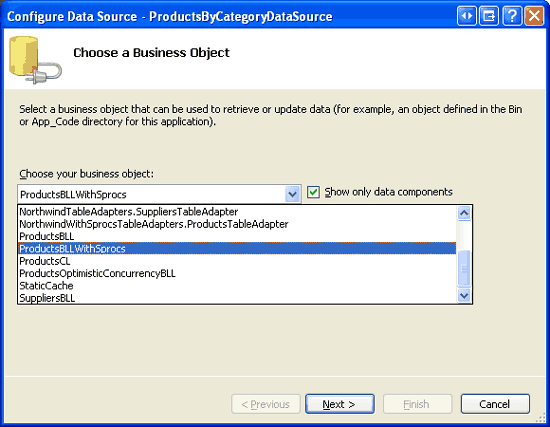 Figure 2 shows Visual Studio after the Products_SelectByCategoryID stored procedure has been saved. Now that the Products_SelectByCategoryID stored procedure has been added to the database, we can configure our Data Access Layer to use this stored procedure when one of its methods is invoked. In particular, we will add a GetProductsByCategoryID(<_i22_>categoryID)<!--_i22_--> method to the ProductsTableAdapter in the NorthwindWithSprocs Typed DataSet that calls the Products_SelectByCategoryID stored procedure we just created. Start by opening the NorthwindWithSprocs DataSet. Right-click on the ProductsTableAdapter and choose Add Query to launch the TableAdapter Query Configuration wizard. In the preceding tutorial we opted to have the TableAdapter create a new stored procedure for us. For this tutorial, however, we want to wire the new TableAdapter method to the existing Products_SelectByCategoryID stored procedure. Therefore, choose the Use existing stored procedure option from the wizard s first step and then click Next. The following screen provides a drop-down list populated with the database s stored procedures. Selecting a stored procedure lists its input parameters on the left and the data fields returned (if any) on the right. 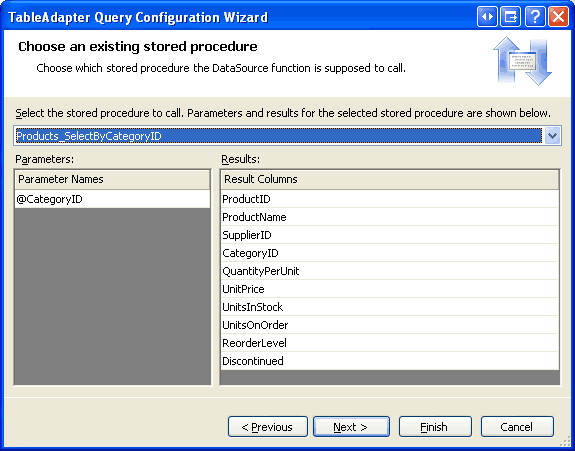 Choose the Products_SelectByCategoryID stored procedure from the list and click Next. 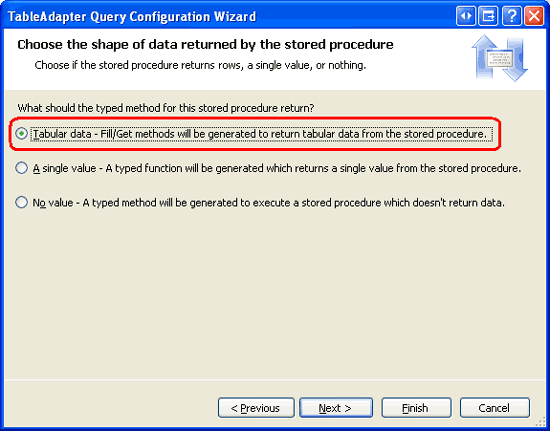 The next screen asks us what kind of data is returned by the stored procedure and our answer here determines the type returned by the TableAdapter s method. For example, if we indicate that tabular data is returned, the method will return a ProductsDataTable instance populated with the records returned by the stored procedure. In contrast, if we indicate that this stored procedure returns a single value the TableAdapter will return an Object that is assigned the value in the first column of the first record returned by the stored procedure. Since the Products_SelectByCategoryID stored procedure returns all products that belong to a particular category, choose the first answer - Tabular data - and click Next. All that remains is to indicate what method patterns to use followed by the names for these methods. Leave both the Fill a DataTable and Return a DataTable options checked, but rename the methods to FillByCategoryID and GetProductsByCategoryID. Then click Next to review a summary of the tasks the wizard will perform. If everything looks correct, click Finish. The TableAdapter methods we just created, FillByCategoryID and GetProductsByCategoryID, expect an input parameter of type Integer. This input parameter value is passed into the stored procedure via its @CategoryID parameter. If you modify the Products_SelectByCategory stored procedure s parameters, you'll need to also update the parameters for these TableAdapter methods. As discussed in the previous tutorial, this can be done in one of two ways: by manually adding or removing parameters from the parameters collection or by rerunning the TableAdapter wizard. 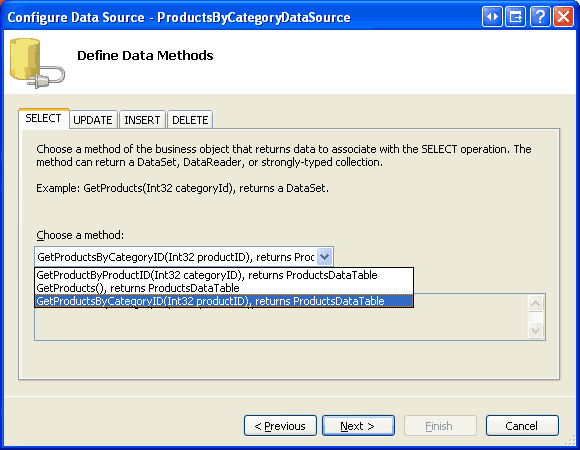 This BLL method simply returns the ProductsDataTable returned from the ProductsTableAdapter s GetProductsByCategoryID method. The DataObjectMethodAttribute attribute provides metadata used by the ObjectDataSource s Configure Data Source wizard. In particular, this method will appear in the SELECT tab s drop-down list. 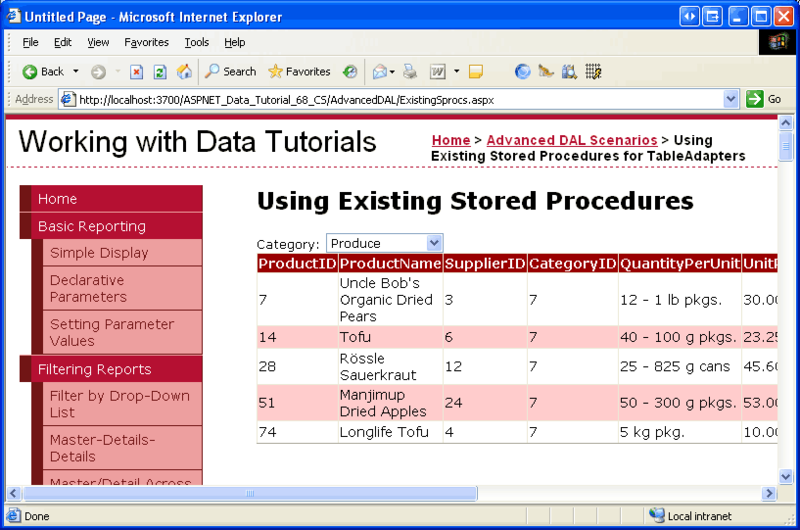 To test the newly added Products_SelectByCategoryID stored procedure and the corresponding DAL and BLL methods, let s create an ASP.NET page that contains a DropDownList and a GridView. The DropDownList will list all of the categories in the database while the GridView will display the products belonging to the selected category. We ve created master/detail interfaces using DropDownLists in previous tutorials. For a more in-depth look at implementing such a master/detail report, refer to the Master/Detail Filtering With a DropDownList tutorial. Open the ExistingSprocs.aspx page in the AdvancedDAL folder and drag a DropDownList from the Toolbox onto the Designer. Set the DropDownList s ID property to Categories and its AutoPostBack property to True. Next, from its smart tag, bind the DropDownList to a new ObjectDataSource named CategoriesDataSource. 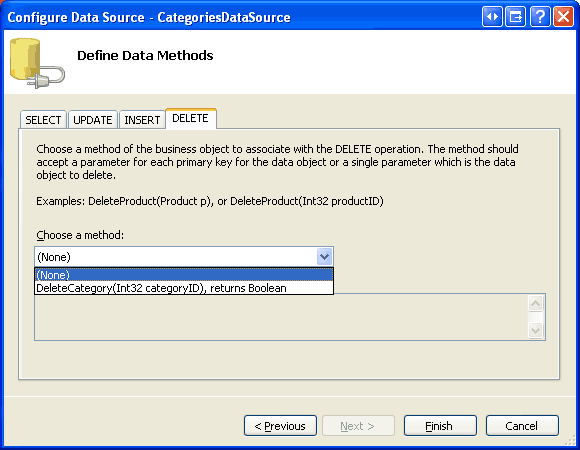 Configure the ObjectDataSource so that it retrieves its data from the CategoriesBLL class s GetCategories method. Set the drop-down lists in the UPDATE, INSERT, and DELETE tabs to (None) . 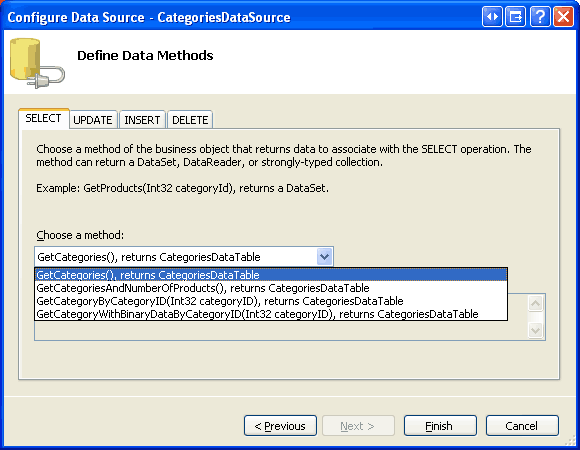 After completing the ObjectDataSource wizard, configure the DropDownList to display the CategoryName data field and to use the CategoryID field as the Value for each ListItem. Next, drag a GridView onto the Designer, placing it beneath the DropDownList. Set the GridView s ID to ProductsByCategory and, from its smart tag, bind it to a new ObjectDataSource named ProductsByCategoryDataSource. 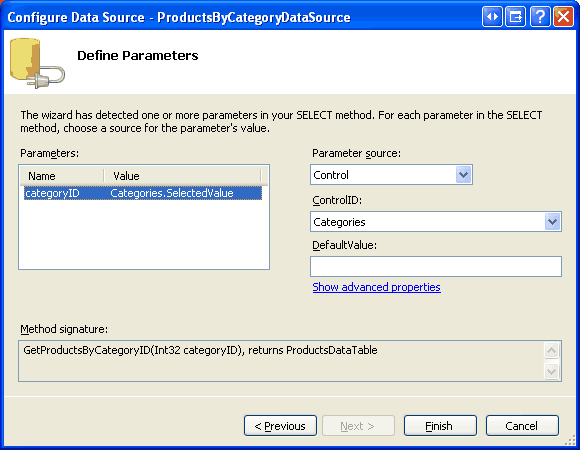 Configure the ProductsByCategoryDataSource ObjectDataSource to use the ProductsBLLWithSprocs class, having it retrieve its data using the GetProductsByCategoryID(categoryID) method. Since this GridView will only be used to display data, set the drop-down lists in the UPDATE, INSERT, and DELETE tabs to (None) and click Next. The method chosen in the SELECT tab expects a parameter, so the final step of the wizard prompts us for the parameter s source. Set the Parameter source drop-down list to Control and choose the Categories control from the ControlID drop-down list. Click Finish to complete the wizard. Upon completing the ObjectDataSource wizard, Visual Studio will add BoundFields and a CheckBoxField for each of the product data fields. Feel free to customize these fields as you see fit. Visit the page through a browser. When visiting the page the Beverages category is selected and the corresponding products listed in the grid. Changing the drop-down list to an alternative category, as Figure 12 shows, causes a postback and reloads the grid with the products of the newly selected category. 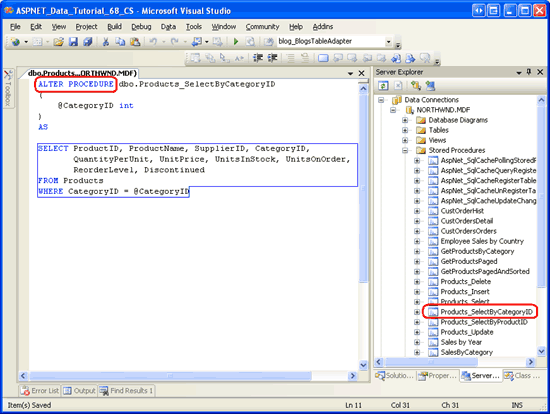 The Wrapping Database Modifications within a Transaction tutorial used the ADO.NET classes in the DAL. The remainder of this tutorial examines how to manage a transaction using T-SQL commands from within a stored procedure. Indicate the start of a transaction. 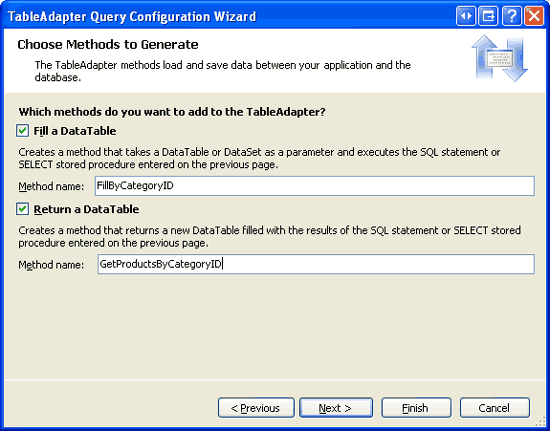 Execute the SQL statements that comprise the transaction. If there is an error in any one of the statements from Step 2, rollback the transaction. If all of the statements from Step 2 complete without error, commit the transaction. -- If we reach here, success! 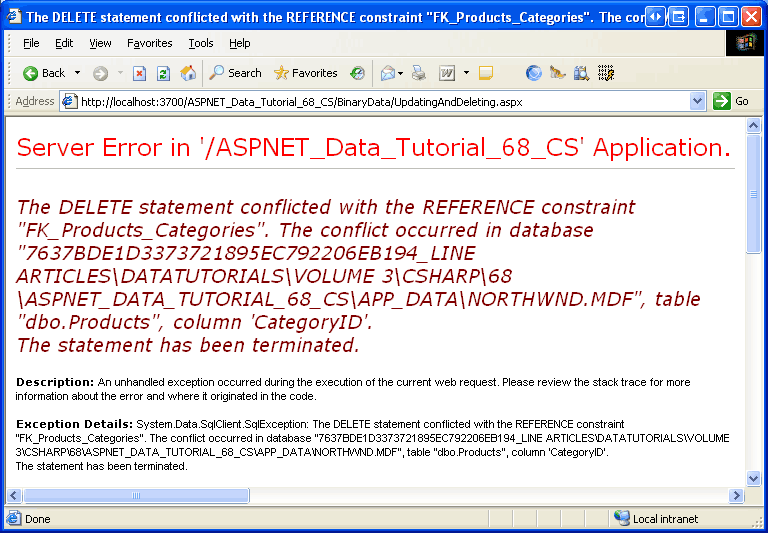 The template starts by defining a TRY...CATCH block, a construct new to SQL Server 2005. Like with Try...Catch blocks in Visual Basic, the SQL TRY...CATCH block executes the statements in the TRY block. If any statement raises an error, control is immediately transferred to the CATCH block. If there are no errors executing the SQL statements that makeup the transaction, the COMMIT TRANSACTION statement commits the changes and completes the transaction. If, however, one of the statements results in an error, the ROLLBACK TRANSACTION in the CATCH block returns the database to its state prior to the start of the transaction. The stored procedure also raises an error using the RAISERROR command, which causes a SqlException to be raised in the application. Since the TRY...CATCH block is new to SQL Server 2005, the above template will not work if you are using older versions of Microsoft SQL Server. If you are not using SQL Server 2005, consult Managing Transactions in SQL Server Stored Procedures for a template that will work with other versions of SQL Server. Let s look at a concrete example. 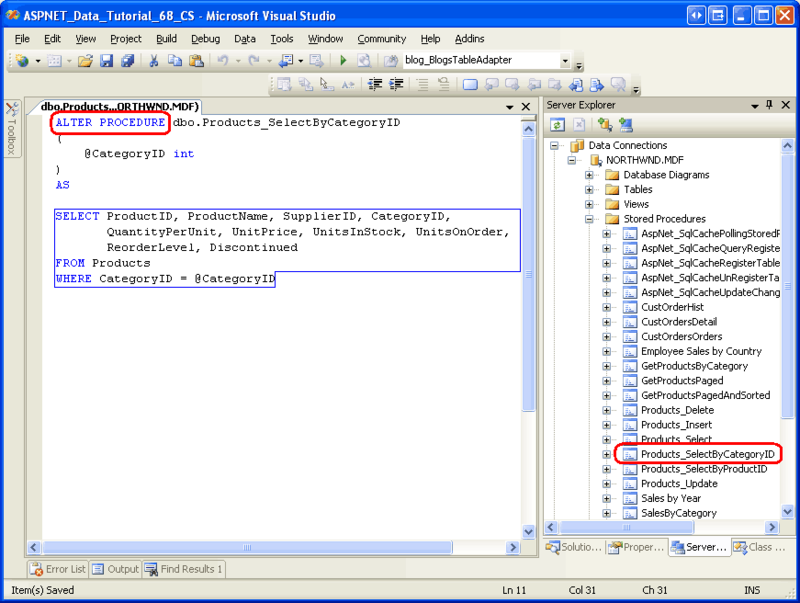 A foreign key constraint exists between the Categories and Products tables, meaning that each CategoryID field in the Products table must map to a CategoryID value in the Categories table. 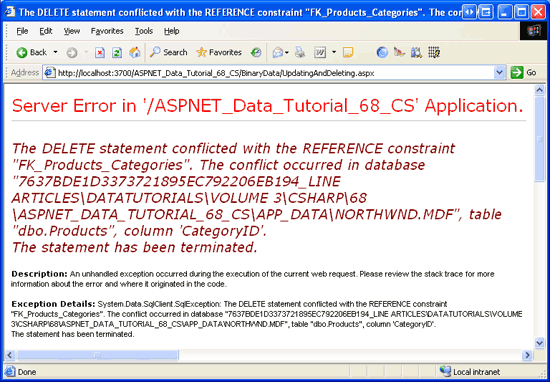 Any action that would violate this constraint, such as attempting to delete a category that has associated products, results in a foreign key constraint violation. To verify this, revisit the Updating and Deleting Existing Binary Data example in the Working with Binary Data section (~/BinaryData/UpdatingAndDeleting.aspx). 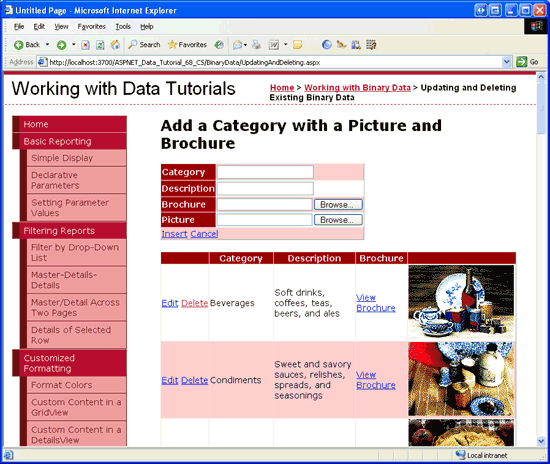 This page lists each category in the system along with Edit and Delete buttons (see Figure 13), but if you attempt to delete a category that has associated products - such as Beverages - the delete fails due to a foreign key constraint violation (see Figure 14). Imagine, though, that we want to allow categories to be deleted regardless of whether they have associated products. Should a category with products be deleted, imagine that we want to also delete its existing products (although another option would be to simply set its products CategoryID values to NULL). This functionality could be implemented through the cascade rules of the foreign key constraint. Alternatively, we could create a stored procedure that accepts a @CategoryID input parameter and, when invoked, explicitly deletes all of the associated products and then the specified category. While this will definitely delete the associated products and category, it does not do so under the umbrella of a transaction. Imagine that there is some other foreign key constraint on Categories that would prohibit the deletion of a particular @CategoryID value. The problem is that in such a case all of the products will be deleted before we attempt to delete the category. The net result is that for such a category, this stored procedure would remove all of its products while the category remained since it still has related records in some other table. 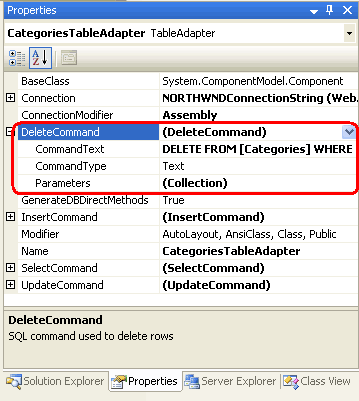 Take a moment to add the Categories_Delete stored procedure to the Northwind database. Refer back to Step 1 for instructions on adding stored procedures to a database. While we ve added the Categories_Delete stored procedure to the database, the DAL is currently configured to use ad-hoc SQL statements to perform the delete. We need to update the CategoriesTableAdapter and instruct it to use the Categories_Delete stored procedure instead. Earlier in this tutorial we were working with the NorthwindWithSprocs DataSet. But that DataSet only has a single entity, ProductsDataTable, and we need to work with categories. Therefore, for the remainder of this tutorial when I talk about the Data Access Layer I m referring to the Northwind DataSet, the one that we first created in the Creating a Data Access Layer tutorial. Open the Northwind DataSet, select the CategoriesTableAdapter, and go to the Properties window. The Properties window lists the InsertCommand, UpdateCommand, DeleteCommand, and SelectCommand used by the TableAdapter, as well as its name and connection information. Expand the DeleteCommand property to see its details. As Figure 15 shows, the DeleteCommand s CommandType property is set to Text, which instructs it to send the text in the CommandText property as an ad-hoc SQL query. To change these settings, select the (DeleteCommand) text in the Properties window and choose (New) from the drop-down list. This will clear out the settings for the CommandText, CommandType, and Parameters properties. Next, set the CommandType property to StoredProcedure and then type in the name of the stored procedure for the CommandText (dbo.Categories_Delete). If you make sure to enter the properties in this order - first the CommandType and then the CommandText - Visual Studio will automatically populate the Parameters collection. 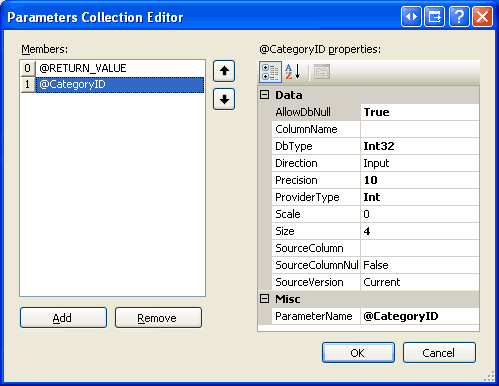 If you do not enter these properties in this order, you will have to manually add the parameters through the Parameters Collection Editor. In either case, it s prudent to click on the ellipses in the Parameters property to bring up the Parameters Collection Editor to verify that the correct parameter settings changes have been made (see Figure 16). If you do not see any parameters in the dialog box, add the @CategoryID parameter manually (you do not need to add the @RETURN_VALUE parameter). Once the DAL has been updated, deleting a category will automatically delete all of its associated products and do so under the umbrella of a transaction. To verify this, return to the Updating and Deleting Existing Binary Data page and click the Delete button for one of the categories. With one single click of the mouse, the category and all of its associated products will be deleted. Before testing the Categories_Delete stored procedure, which will delete a number of products along with the selected category, it might be prudent to make a backup copy of your database. If you are using the NORTHWND.MDF database in App_Data, simply close Visual Studio and copy the MDF and LDF files in App_Data to some other folder. After testing the functionality, you can restore the database by closing Visual Studio and replacing the current MDF and LDF files in App_Data with the backup copies. While the TableAdapter s wizard will automatically generate stored procedures for us, there are times when we might already have such stored procedures created or want to create them manually or with other tools instead. To accommodate such scenarios, the TableAdapter can also be configured to point to an existing stored procedure. In this tutorial we looked at how to manually add stored procedures to a database through the Visual Studio environment and how to wire the TableAdapter s methods to these stored procedures. We also examined the T-SQL commands and script pattern used for starting, committing, and rolling back transactions from within a stored procedure. This tutorial series was reviewed by many helpful reviewers. Lead reviewers for this tutorial were Hilton Geisenow, S ren Jacob Lauritsen, and Teresa Murphy. Interested in reviewing my upcoming MSDN articles? If so, drop me a line at mitchell@4GuysFromRolla.com.